International relations scholars and observers have been clamouring to characterise the growing engagement of world powers on the continent of Africa as a ‘new scramble for Africa,’ dredging up the spectre of neo-colonialism. This sentiment has been fueled by recent developments such as the creation of a new U.S. combatant Africa Command (AFRICOM), and by increasing infrastructure investment and economic engagement by other countries like China, India, and Russia. Long and intractable conflicts involving U.S. ground forces in Afghanistan and Iraq have altered U.S. grand strategy approaches to confronting and mitigating the spread of violent extremism in foreign lands. The U.S. has undergone a noticeable strategic shift from the utilisation of conventional ground forces to combat terrorism to a small footprint paradigm of engagement. 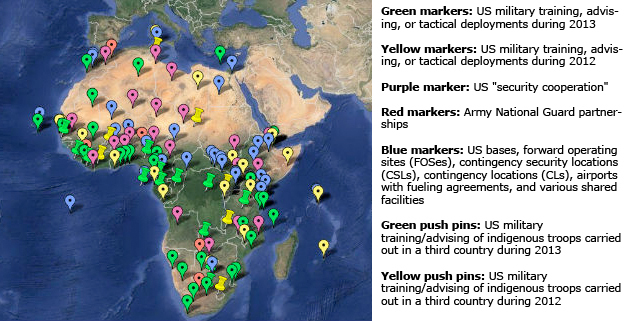 This strategy has been on full display as the U.S. military has expanded into Africa via numerous ‘small’ installations such as forward operating locations, cooperative security locations, and other temporary-sounding names. Given the fact that the U.S. has deliberately and fastidiously constructed a constellation of military locations on the continent —allowing for the projection of force and facilitation of development projects continent-wide—perhaps ‘scramble’ is not the best word to describe the state of affairs. Clearly, the U.S. has already achieved a dominant level of engagement, dwarfing the efforts of any other competing nation or bloc. President Obama’s much-heralded geopolitical ‘pivot’ to Asia has failed to produce the well-defined strategic footprint and mission sets observed with the advent of AFRICOM. The administrations of both Obama and George W. Bush significantly grew U.S. engagement—both in terms of military and development aid—in Africa. After more than a decade of accelerated military expansion across the continent, what does a Donald Trump presidency portend for the United States’ Africa strategy? At this point, not much is known about Trump’s foreign policy other than his ‘I would bomb the s— out of them (ISIS)’ strategy espoused during the 2016 U.S. presidential campaign. Apart from the memeification’ of U.S. foreign policy, one of the U.S.’ primary security concerns (post-9/11) is the franchising of groups like Al-Qaeda and ISIS to Africa. In fact, ISIS appears to be well on its way in establishing footholds in Libya and Somalia. Considering president-elect Trump’s rhetoric on ISIS, U.S. unilateralism could become the prevailing approach. If the U.S. abandons its current bilateral and multilateral partnerships in Africa, we could witness the unravelling of security and aid relationships that have been painstakingly crafted by U.S. commanders, diplomats, and development experts over the past decade. For example, through the efforts of Combined Joint Task Force—Horn of Africa (CJTF-HOA) based at Camp Lemonnier in Djibouti, the U.S. military has assembled a robust security cooperation infrastructure with countries in East Africa in order to support the multinational conflict against Al Shabaab in Somalia. The CJTF-HOA approach has blended civil-military operations such as military-to-military training and local development projects (building wells and schools) with tactical Special Operations Forces (SOF) deployments against terrorist groups. Observers may debate the merits of AFRICOM’s expansionist approach—there has been significant push back in some, asserting AFRICOM is a manifestation of U.S. imperialism —but regardless of one’s opinion of the U.S. strategy in Africa, it cannot be denied that the U.S. Departments of Defence and State have invested billions of dollars and much time cultivating key relationships with African countries. Stakeholders may argue over the way in which these relationships are carried out in the future, but one hopes Trump does not cast aside U.S. strategic commitments whole-cloth. Since a robust framework for engagement has been established over several years’ time, it would be unwise to pursue a highly unilateral solution to ISIS and other violent groups on the African continent. AFRICOM operations are already criticised for being ineffective at reducing violent conflict. Ratcheting up unilateral kinetic operations along the lines of “bomb the s— out of them” could produce deleterious reactions from key nations that could impair or severe strategic relationships which have taken years to establish. A complete strategic reversal in Africa—abandoning small footprint in favour of sending in conventional forces—could have disastrous consequences for important U.S. relationships on the continent, many of which are delicate at best. Presumably, the Trump administration will take a more circumspect approach to countering terrorism in Africa. However, Trump’s 15 August campaign speech laying out his plan to confront terrorism described a return to utilising large contingents of conventional forces to protect U.S. overseas assets and to carry out U.S. foreign policy. Relationships are built upon trust, and trust can take years to develop. Unfortunately, it can be broken very quickly. Hopefully, President-elect Trump is able to perceive the long-term importance of the arduous work of relationship-building that past administrations have undertaken and work to preserve those relationships even if his Africa strategy charts a new course. Tony Manganello is a U.S.-based PhD research student in the War Studies Department at King’s College London. His research focuses on U.S. military and intelligence engagement in Kenya. Many journalists, including Nick Turse and Craig Whitlock, have closely followed AFRICOM’s development in recent years and reported on the U.S. military’s expansive growth on the continent. For comprehensive reporting on this see Nick Turse, Tomorrow’s Battlefield : U.S. Proxy Wars and Secret Ops in Africa (Chicago, US: Haymarket Books, 2015), http://site.ebrary.com/lib/alltitles/docDetail.action?docID=11055831. Jeffrey Gettleman, “‘I’m Scared These Men Will Kill Everyone’: ISIS Takes a Somalia Town,” The New York Times, October 26, 2016, http://www.nytimes.com/2016/10/27/world/africa/im-scared-these-men-will-kill-everyone-isis-takes-a-somalia-town.html; Ahmed Elumami and Hani Amara, “Libyan Forces Press Forward Against ISIS in Sirte,” The Wire, November 23, 2016, http://thewire.in/81988/libyan-forces-press-forward-isis-sirte/. For an academic analysis of CJTF-HOA activities in Kenya, see Mark Bradbury and Michael Kleinman, Winning Hearts and Minds? : Examining the Relationship Between Aid and Security in Kenya (Feinstein International Center, Tufts University Medford, Mass., 2010), http://www.alnap.org/pool/files/winninghearts-in-kenya.pdf. ; for a sometimes humorous description of CJTF-HOA’s beginnings, see Thomas P. M. Barnett, “The Americans Have Landed,” Esquire, June 27, 2007, http://www.esquire.com/features/africacommand0707. There are several voices in the academic literature on this topic ranging in cultural/geographical origins. See Jeremy H. Keenan, “Africa Unsecured? The Role of the Global War on Terror (GWOT) in Securing US Imperial Interests in Africa,” Critical Studies on Terrorism 3, no. 1 (April 26, 2010): 27–47, doi:10.1080/17539151003594186; and Stefan Gänzle, “AFRICOM and US Africa Policy: ‘pentagonising’ Foreign Policy or Providing a Model for Joint Approaches?,” African Security Review 20, no. 1 (March 2011): 70–82, doi:10.1080/10246029.2011.561020; For an explicitly Kenyan perspective, see Edward Mogire and Kennedy Mkutu Agade, “Counter-Terrorism in Kenya,” Journal of Contemporary African Studies 29, no. 4 (October 2011): 473–91, doi:10.1080/02589001.2011.600849; For the perspective of a former US ambassador to African countries, see John Campbell, “Is American Policy toward Sub-Saharan Africa Increasingly Militarized?,” American Foreign Policy Interests 35, no. 6 (December 11, 2013): 346–51, doi:10.1080/10803920.2013.855547. Michael Shank, “Violence or Vaccines: Which Path for U.S. in Africa?,” Reuters Blogs – The Great Debate, accessed August 7, 2014, http://blogs.reuters.com/great-debate/2014/08/06/target-u-s-defense-aid-to-africa-on-real-threats-malaria-and-ebola/. David E. Sanger and Maggie Haberman, “Donald Trump’s Terrorism Plan Mixes Cold War Concepts and Limits on Immigrants,” The New York Times, August 15, 2016, http://www.nytimes.com/2016/08/16/us/politics/donald-trump-terrorism.html.